6.500 EUR (ex shipping, incl. taxes) – 10.500 EUR for full options hCCR. Some history: I dived the rEvo from 2007. My first rEvo was a pre-production rEvo II. I introduced the rEvo to ANDI: that was a hard thing, because first ANDI HQ didn’t want to take the rEvo into its program. Finally ANDI had the exclusive training rights for some years. I trained Paul Raaymakers in the ANDI requirements (standards and procedures) and certified him as an ANDI instructor. Now the rEvo is in the program of most technical agencies. 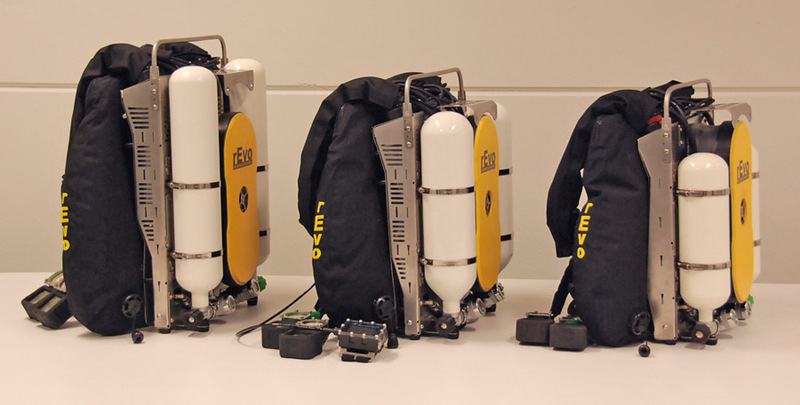 The rEvo is innovative in two ways: the scrubber design and the housing with backmounted lungs. The housing of the lungs is made of stainless steel or the light/expensive titanium (optional). The rEvo is available in three sizes: normal, mini and micro. The micro doesn’t have CE (because of the smaller lung sizes). The rEvo can be fitted with a PO2 monitor with HUD (the rEvodream) and/or Shearwater monitor/computer. It can also be fitted with a solenoid thus making it a hybrid CCR or electronic CCR. The oxygen injection button and diluent injection button are fitted on the bottom of the housing (on your “but”). I have troubles pressing the button in (very) cold water, because of my stiff fingers. Now one can order an over the shoulder injection button/switch block. To connect off board gasses one has to order an off-board kit. The rEvo has its own backplate, which can be adjusted to the height of the diver. 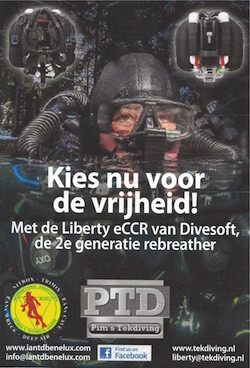 It fits very well and it brings the lungs of the CCR as close as possible to the body of the diver. Originally the rEvo was designed as a simple and cheap mCCR. Now the rEvo full options has 5 cells, deco computer, temp stick (CO2 monitor), big radial scrubbers. To me it lost track of the original idea and the entire “new” stuff looks like “add-ons” on the original. However the unit is easy to dive (good buoyancy) and the case is very robust. A big disadvantage is the fact that there are practically no watertraps in case of (partial) flooding of the unit. The WOB is not perfect (this is especially true for the rEvo II). The inside of the rEvo is of less quality than the case: the cells are in a “plastic cup” in the lower canister and the ADV and O2 injection are loose in the upper canister. Because of the fixed case, it is somewhat difficult to travel with. It is difficult to fit other tank sizes than 2 or 3 ltr. When the scrubbers are not packed well, one runs the risk that (because of the horizontal positioning of the canisters) the Sofnolime can slip out of the canister. Calibration of the cells with the Shearwater is easy. With the rEvodream one needs some exercise… Calibration takes place by tapping the handset and checking the blinks of the HUD. The diver taps, the HUD answers, the diver taps again and then the HUD answers again. Of course there are special frequencies of tapping and blinking. If the divers taps too slow or too fast, the sequence has to start all over again. Luckily it is now possible to get a rEvodream with Shearwater-like switches. One needs also to (manually) calibrate the CO2 sensor (again simply in air). Packing the scrubber is easy, but one needs to pack two scrubbers. They are also available with tempsticks for CO2 monitoring. The scrubbers are the new thing: after two hours on the scrubbers one can replace the upper scrubber with the lower scrubber. The lower scrubber is replaced by a fresh one. In this way it is possible to get 4 hours out of approximately 2.5 kg Sofnolime. If one makes a long dive without scrubber switch, then the duration is still 3 hours. The scrubbers are placed in series: the gas flows via the cover of the scrubber from upper scrubber to lower scrubber. Putting the hoses is easy: one can only screw them on in one way. It is very hard to take the lungs out of the housing. But there is no need to do so. Cleaning the lungs is simply done by putting water through the hose connectors. But take the cells out first! The tanks are put on the unit with special clamps. The max size is limited to 3 lltrs. Trim is good, when the top weights are in place. The lungs are on the back, so that makes it easy to keep a horizontal position. There are some discussions about the WOB for the rEvo II and III. On the rEvo II it was (very) bad. Some adjustments were made on the III, necessary to pass CE requirements. Personally I didn’t experience any serious WOB problems: not on the II and not on the III. The titanium version is quite light. But the stainless steel version is heavier. The case makes the unit rather unpractical to travel with. Also the handsets cannot be disconnected from the unit. So: not much modularity. A special adjustable backplate is integrated with the unit. Safety is ok. Only one drawback: the lack of watertraps. A minor flood forces the diver to bailout. The HUD is a good PO2 monitor, also in bright water. The blinking sequences are easy to understand. The changing of the scrubbers must be done in a good way: divers tend to forget the way and order the scrubbers have to be changed. All rEvo’s are equipped with a neck strap for the DSV. In case of convulsions (caused by hyperoxia) the DSV stays in the mouth. In the early days of the rEvo, the rEvo was the cheapest (m)CCR in the market. But that has changed. If you get a titanium rEvo full options, it’s over 10K EUR. Spare parts are quickly available with the manufacturer. Service is how it should be. Owners get regular emails from the manufacturer on novelties, updates and recalls. The housing is good. The way the cells, ADV and orifice are built in, is of lower quality. Also the material of the canisters is not very good. Some divers complain about the quality of the big radial scrubbers. The inside of the rEvo looks a bit cheap. The unit is CE rated until 80 mtrs. I dived it to 210 mtrs. But this manual unit was not suitable for that depth. I personally think that manual CCR’s in general have a limit of 120 – 140 mtrs.